• Built-in magneto telephone instrument. • Sleek cabinet in ergonomic, aesthetic and compact shape. • Snug fitting handset cradle and hook switch. 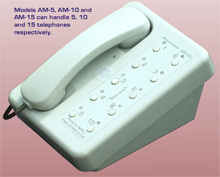 • Siemens type handset with dynamic transducers. • Hand generator replaced by push-button calling system. • Toggle switches replaced by micro-switches. • One-touch operation for calling and selecting extension. • Sealed relays for all switching activities. • Dual-colour LEDs to indicate annunciation and line selection. • Incoming call LED remains on till call is answered. • Solid-state circuitry with modular connectors. • Electronic ringing system with piezo-ceramic tone callers. • Complete secrecy for all channels. • Operator can conference with up to three extensions.